Toronto is home to an amazing abundance of street art and graffiti artists. 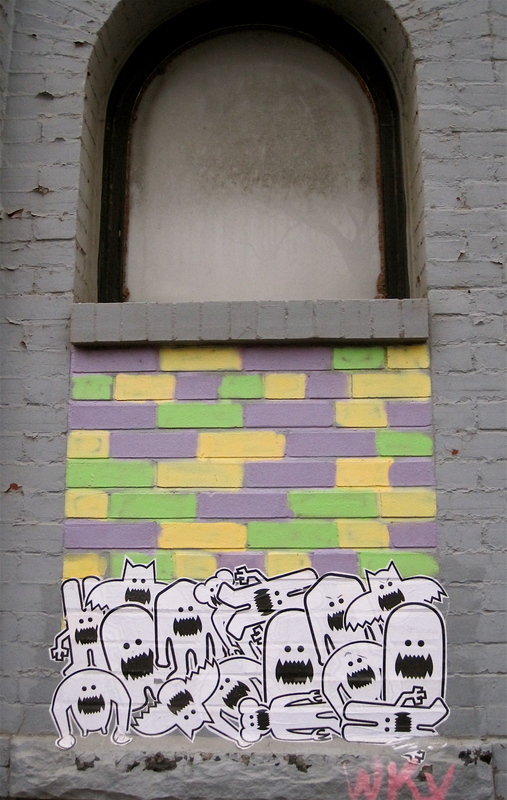 I’ve spotted this particular piece in two different spots along Queen Street, and I’m sure there’s more around the city. They appeared about a month or so before Halloween, and I kept noticing them out of the corner of my eye as I zipped by on my bike en route to work. There’s something about the childlike simplicity that I find appealing. I really dig the use of an already existing “framed canvas”, with the basic squares of complimentary colours, coupled with the pre-designed decal monsters, which the artist lovingly arranged to create what I have dubbed ‘The Monster Mash’. It’s simple, catches the eye, and for some reason makes me happy when I see it. This entry was posted on November 24, 2009 at 19:35 and is filed under Words. You can follow any responses to this entry through the RSS 2.0 feed. You can leave a response, or trackback from your own site.